This psalter was made in Ireland (Armagh? ), probably in the late 12th century to judge from the style of the script. 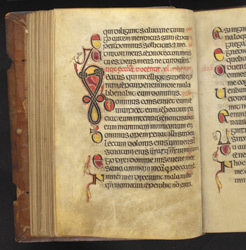 The scribe signed his name on one of its pages: 'Cormacus wrote this psalter: pray for him'. Its decoration shares some features of manuscripts from Armagh, but it combines stylistic elements seen in 8th- and 9th-century illumination (in masterpieces such as the Book of Kells) with current styles. Containing canticles or verse passages from the Bible, such as Deut. 32:1-43, as well as the Book of Psalms, it was used as a prayerbook or hymnal in church services. A brightly coloured animal forms the first letter of Psalm 40 (41), 'Beatus qui intelligit' ('Blessed is he who has regard'). The title in red above interprets the psalm allegorically as 'the voice of the teaching Church,' giving it a Christian significance in addition to its historical identity as a Hebrew song of prayer. Smaller decorated letters aid the reader in separating verses and sentences.